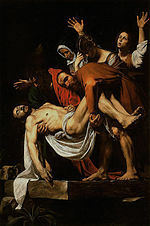 Maundy Thursday (also known as Holy Thursday, Covenant Thursday, Great and Holy Thursday, Sheer Thursday, and Thursday of Mysteries, among other names) is the Christian holy day falling on the Thursday before Easter. 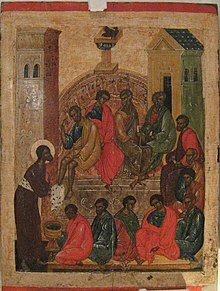 It commemorates the Washing of the Feet (Maundy) and Last Supper of Jesus Christ with the Apostles, as described in the canonical gospels. 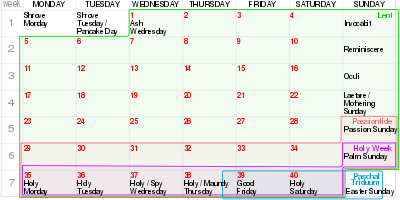 It is the fifth day of Holy Week, preceded by Holy Wednesday (Spy Wednesday) and followed by Good Friday. "Maundy" comes from the Latin word mandatum, or commandment, reflecting Jesus' words "I give you a new commandment." The day comes always between March 19 and April 22, inclusive, and will vary according to whether the Gregorian calendar or the Julian calendar is used. Eastern churches generally use the Julian system. 1.1 Derivation of the name "Maundy"
Use of the names "Maundy Thursday", "Holy Thursday", and others is not evenly distributed. The generally accepted name for the day varies according to geographical area and religious affiliation. Thus, although in England "Maundy Thursday" is the normal term, the term is less commonly used in Ireland, Scotland or Canada. People may use one term in a religious context and another in the context of the civil calendar of the country in which they live. As of 2017[update], the Roman Rite of the Catholic Church uses the name "Holy Thursday" in its official English-language liturgical books. 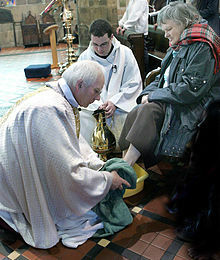 The personal ordinariates in the Catholic Church, which have an Anglican patrimony, retain the traditional English term "Maundy Thursday", however. 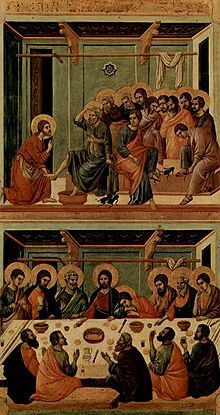 An article in the 1911 Catholic Encyclopedia used the term "Maundy Thursday", and some Catholic writers use the same term either primarily, or alternatively. The day has also been known in English as Shere Thursday (also spelled Sheer Thursday), from the word shere (meaning "clean" or "bright"). This name might refer to the act of cleaning, or to the fact that churches would switch liturgical colors from the dark tones of Lent, or because it was customary to shear the beard on that day, or for a combination of reasons. This name has cognates throughout Scandinavia, such as Danish Skærtorsdag, Swedish Skärtorsdag, Norwegian Skjærtorsdag, Faroese Skírhósdagur and Skírisdagur, and Icelandic Skírdagur. Others theorize that the English name "Maundy Thursday" arose from "maundsor baskets" or "maundy purses" of alms which the king of England distributed to certain poor at Whitehall before attending Mass on that day. Thus, "maund" is connected to the Latin mendicare, and French mendier, to beg. A source from the Shepherd of the Springs, Lutheran Church likewise states that, if the name was derived from the Latin mandatum, we would call the day Mandy Thursday, or Mandate Thursday, or even Mandatum Thursday; and that the term "Maundy" comes in fact from the Latin mendicare, Old French mendier, and English maund, which as a verb means to beg and as a noun refers to a small basket held out by maunders as they maunded. Other sources reject this etymology. The Washing of the Feet is a traditional component of the celebration among many Christian groups, including the Armenian, Ethiopian, Eastern Catholic, Schwarzenau (German Baptist) Brethren, Church of the Brethren, Mennonite, and Roman Catholic traditions. The practice is also becoming increasingly popular as a part of the Maundy Thursday liturgy in the Anglican/Episcopal, Lutheran, Methodist, Baptist and Presbyterian churches, as well as in other Protestant denominations. Maundy Thursday is notable for being the day on which the Chrism Mass is celebrated in each diocese. The Chrism Mass is one of the most solemn and important liturgies of the liturgical year. Usually held in the diocesean cathedral, it is generally held on the morning of Maundy Thursday, but may in some dioceses take place on another day during Holy Week. It is often the largest annual gathering of clergy and faithful held in most dioceses. The Mass is a celebration of the institution of the priesthood. During the Mass, those present are called to renew their baptismal promises; priests/ministers and deacons also reaffirm their ministry by renewing the promises made at their ordination. The Mass takes its name from the blessing of the holy oils used in the sacraments throughout the year, which are then given to priests to take back to their parishes. The Rite of Reception of the Oils by representatives of the diocesan parishes is a sign of each parish's unity with the Bishop and the diocesan Church. The oil of the catechumens and chrism are used on the upcoming Holy Saturday at the Easter Vigil, for the baptism and confirmation of those entering the church. While the Oil of the Catechumens and the Oil of the Sick, are simply "blessed," the Sacred Chrism is "consecrated,". Holy chrism is a mixture of olive oil and balsam, an aromatic resin. Balsam is poured into the oil, which gives it a sweet smell intended to remind those who encounter it of the "odor of sanctity" to which those who are marked with it, are called to strive. The bishop breathes over the vessel containing the chrism, a gesture which symbolizes the Holy Spirit coming down to consecrate this oil, and recalls the actions of Jesus in John 20:22, when he breathed on the apostles and said, "Receive the Holy Spirit..."
With respect to Anglicanism, the 1979 Book of Common Prayer (p. 307) calls for chrism to be consecrated by the bishop. In many dioceses, the consecration of chrism by the bishop may be done at a service of reaffirmation of ordination vows during Holy Week. During the Chrism Eucharist, the Bishop will bless the oils used throughout the next year for baptisms and healing. In addition, the Bishop and clergy in attendance will reaffirm their Ordination Vows. In Kerala State in India, the day is called as Pesaha(പെസഹ), a Malayalam word derived from the Aramaic or Syriac word for Passover. It is a statewide public holiday declared by the Government of Kerala, given the high number of Saint Thomas Christians in the state. The tradition of consuming Pesaha appam or Indariyappam is customary after special longer Holy Qurbana, which are conducted on the or at midnight till morning in churches of Saint Thomas Christians. On the evening before Good Friday the Pesaha bread is made at home. It is made with unleavened flour and they use a sweet drink made up of coconut milk and jaggery along with this bread (can be compared to Charoset). On the Pesaha night the bread is steamed in a new vessel, immediately after rice flour is mixed with water and they pierce it many times with handle of the spoon to let out the steam so that the bread will not rise. This bread is cut by the head of the family and shared among the family members after prayers. In some families, a creamy dip made up of jaggery and coconut milk is used along with the Pesaha bread. If the family is in mourning following a death, Pesaha bread is not made at their home, but some of the Saint Thomas Christian neighbours share their bread with them. The Saint Thomas Christians diaspora also celebrate this day by having Holy Communion services in the parishes according to their respective liturgies. The tradition of washing feet by priests is practiced in every parish commemorating Jesus washing the feet of his disciples symbolizing humbleness. Christus, by the Lutheran Lucas Cranach the Elder. This woodcut of John 13:14–17 is from Passionary of the Christ and Antichrist. Maundy Thursday is a public holiday in most countries that were part of the Spanish empire (Argentina, Colombia, Costa Rica, El Salvador, Guatemala, Honduras, Mexico, Nicaragua, Paraguay, Peru, the Philippines, Spain, Uruguay and Venezuela), countries that were part of the Danish colonial empire (Denmark, Iceland, Norway and United States Virgin Islands), and in the Kerala State of India. Certain German states declare a public holiday for public sector employees. In the UK, civil servants were traditionally granted a half-day holiday (known as "privilege leave") on this date, but that was abolished after 2012. ^ Authors, Various (2008). Mariology: A Guide for Priests, Deacons, Seminarians, and Consecrated Persons. Mark I. Miravalle, S.T.D. p. 659. ISBN 9781579183554. Retrieved 5 April 2014. The season of Lent prepares the Church for the celebration of the Paschal Mystery during the sacred Triduum of Maundy Thursday, Good Friday, and Holy Saturday. ^ a b How is oil used in worship?. Evangelical Lutheran Church in America. 2013. p. 2. This service, also called a Chrism Mass, is held during Holy Week and presided over by a synodical bishop. At this unique liturgy, the blessing of oil is coupled with a renewal of vows for rostered leaders. The traditional day for this service is Maundy Thursday). Herbermann, Charles, ed. (1913). "Maundy Thursday" . Catholic Encyclopedia. New York: Robert Appleton Company. This page was last edited on 20 April 2019, at 11:24 (UTC).